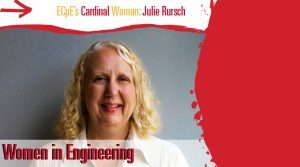 Julie Rursch, lecturer in the Department of Electrical and Computer Engineering at Iowa State University, is one of many inspiring women at Iowa State. Rursch and 71 other selected women at ISU are a part of Cardinal Women, a university group specifically for women focusing on leadership development in both personal and professional settings. Cardinal Women is a newer organization, established just last fall 2018. Rursch and her fellow colleagues met four times, once a month. Each member met with a smaller group of roughly ten members; Rursch was in the strategic women group. While Rursch was in a group of women in STEM-related fields, she also met other women, faculty and staff, from all across campus. When the subgroups met throughout the fall semester, they often discussed current issues and situations women experience on campus or when pursuing a job. For example, Rursch says she learned that women tend to see more empathetic words in reference letters written by mentors and professors, while men see more scientific words. “We learned that in reference letters we should pay attention to the words we use, like saying she is ‘kind, compassionate or competent.’ We want to make sure she is outstanding in her field, analytical or things that are much more defined,” Rursch said. Rursch has also learned a lot about things such as privilege and effective communication and how to apply these themes to the classroom. “I learned that there are a lot of privileges that you don’t choose and that I didn’t think a lot about until Cardinal Women, like how living and growing up in the Midwest is a privilege in itself,” Rursch said. Rursch’s group also discussed how women tend to communicate in their careers. After learning many new strategies to effectively lead students at ISU, Rursch is ready to apply these methods in the classroom. She plans to change some of the lab interactions so she doesn’t assume any sort of approach, making it applicable to everyone regardless of their privileges. Cardinal Women was successful in its first semester. Rursch says that she would love to do it again next year and plans on it.